ZERO IN OLD SACRAMENTO (‘46 Republic) Bill Elliott (now billed William Elliott) is badly miscast in his first big budget Republic western, having graduated to “A” status from the Red Ryder series. 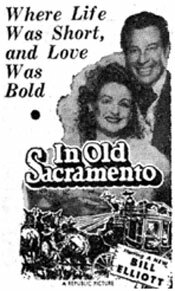 A remake of Roy Rogers’ “Carson City Kid” (‘40), “…Sacramento” is overlong at 88 minutes, basically actionless, drudgingly dull and more of a romantic costume drama than a western. Gambler Elliott secretly poses as notorious bandit, Spanish Jack, falls in love with showboat singing star, Constance Moore, and vows to give up his outlaw ways—after one final fling. Eventually he realizes a young miner will make a better husband for Moore than he ever could and lets the sheriff catch and kill him during his last fling as Spanish Jack. I suppose Elliott saw some of the good-badman type role he so loved in William S. Hart in the role, but the final product is, in a word, boring—with an unpleasant ending. 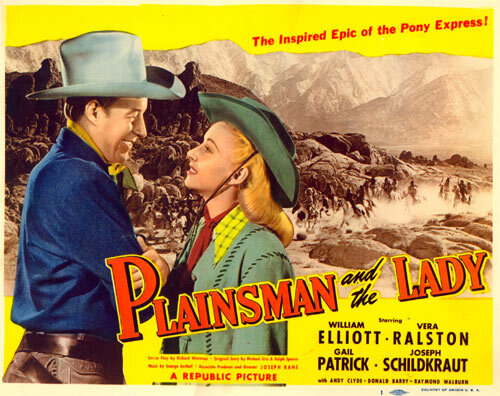 PLAINSMAN AND THE LADY (‘46 Republic) Overlong Pony Express yarn with an emphasis on romance was earmarked for John Wayne but Duke, having just made “Dakota” with Vera Ralston, didn’t care for her thespic abilities and begged off this one. Replaced by Elliott, it did little to enhance Bill’s “A” status. Elliott is hired to protect a pony line from hostile Indians and the attacks of a gang led by the owner of a rival stagecoach line. Too many soap operatics follow and lead to a second A-western dud for Bill. 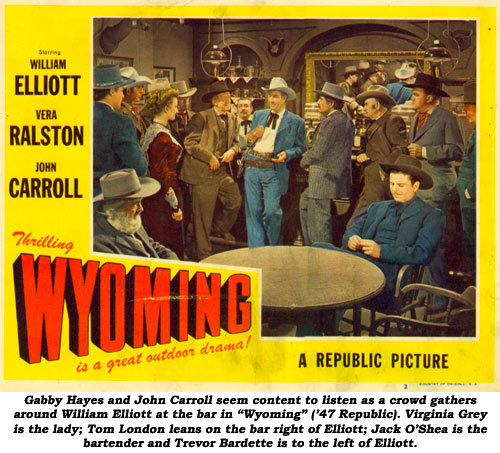 WYOMING (‘47 Republic) An empire building western in the tradition of “Cimarron” is one of Elliott’s best prestige westerns as he rises from pioneer to cattle baron until intruder Albert Dekker publicizes the Homestead Act encouraging nesters which ferments a cattlemen vs. farmers range war allowing Dekker to rustle Elliott’s cattle. Elliott’s foreman, John Carroll, previously loyal to Elliott, finally quits when he realizes (and Elliott doesn’t) the homestead act is law which will forever change the old ways. Bill also finds his daughter, Vera Ralston, deserting his cause as well. Virginia Grey is the saloon girl in love with Elliott but desired by Dekker—over whom they come to blows in a terrific battle darn near equaling that of “The Spoilers”. Incidentally, this was Gabby Hayes’ last Republic film after co-starring with Rogers, Elliott, Autry, Wayne and others in over 65 titles. 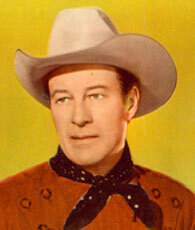 FABULOUS TEXAN, THE (‘47 Republic) This Elliott A-western is, truthfully, John Carroll’s picture all the way. Returning to Texas after the Civil War, buddies Elliott and Carroll find the Texas Rangers disbanded and the crooked state police under the power hungry command of Albert Dekker. When Carroll’s father is murdered, he lashes back, rounding up a band of patriots devoted to crushing Dekker’s tyranny. Meanwhile, Elliott chooses the lawful path and is appointed U.S. Marshal. Slowly but surely, Carroll and his men descend into pure outlawry with the eventual showdown coming between Carroll, Dekker and Elliott. An unusual coda at the end with leading lady Catherine McLeod is reminiscent of “Cimarron” (‘31). 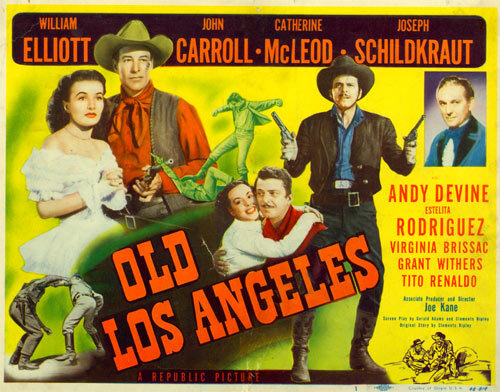 OLD LOS ANGELES (‘48 Republic) Elliott (with pal Andy Devine) joins his bro-ther to prospect for gold. Upon arrival he finds his brother killed, his claim stolen, and outlaws, led by saloon owner Joseph Schildkraut terrorizing the countryside in a land grab spree. Elliott meets Schildkraut’s saloon entertainer, McLeod, secretly a government agent working to get the goods on Schildkraut. Eventually, the hotshot of the gang, John Carroll, becomes power-mad and kills Schildkraut just as Elliott learns Carroll is the one who murdered his brother and faces him in a shootout. Stretched about 30 minutes beyond its ability to hold interest. 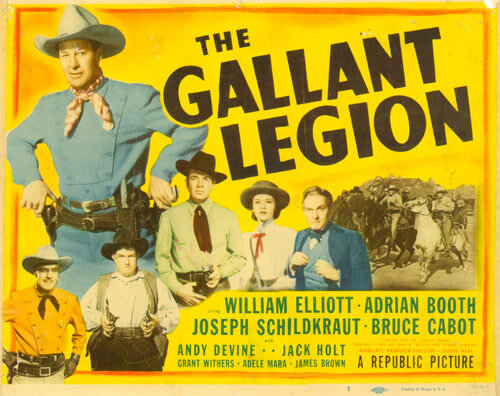 GALLANT LEGION (‘48 Republic) Elliott comes west to ranch with his kid bro-ther who he learns is mixed up with saloon owner Bruce Cabot’s partitionist renegades trying to discredit the Texas Rangers and restore their own crooked state police. When his brother is killed, Elliott joins the Rangers headed up by Capt. Jack Holt. Elliott’s romance with newspaper correspondent Adrian Booth, assigned to write about the Ranger’s exploits, is nearly destroyed when her writings turn against the Rangers—then it’s discovered her uncle is secretly working with Cabot by changing her stories before they are dispatched. Gorgeous Adele Mara is given three songs to sing and abruptly whisked out of sight. 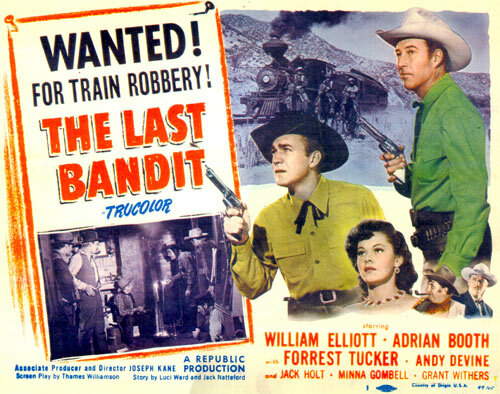 THE LAST BANDIT (‘49 Republic) It’s outlaw bro-ther (Forrest Tucker) against reformed outlaw brother (Elliott) with gorgeous Adrian Booth and a million dollars in express company gold caught in the middle. 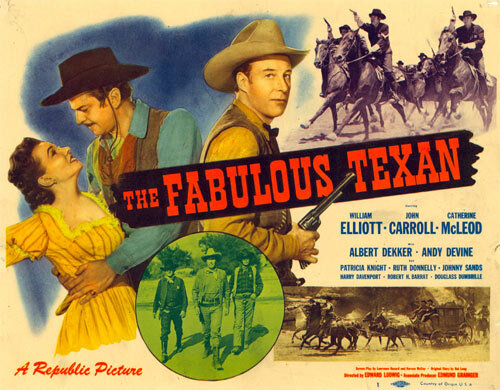 Tucker and his gang with Booth try to involve Elliott in an elaborately planned train robbery but, when he won’t cooperate, they frame him; making railroad official Jack Holt and railroad security man Andy Devine believe Bill is part of the well-staged hold-up. Bill’s first in Trucolor is a remake of Bob Steele’s “Great Train Robbery” (‘41). 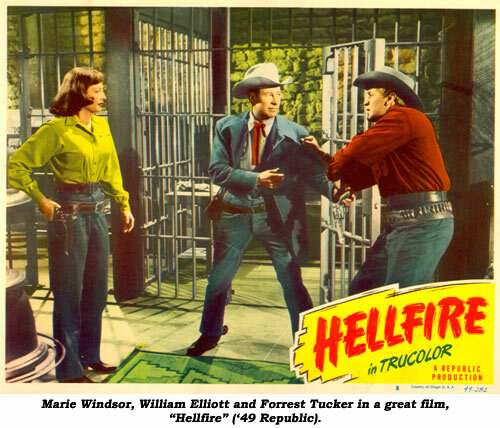 HELLFIRE (‘49 Republic) One of the best and most unusual westerns ever made, and certainly Elliott’s finest, right in the good-badman mold of his “hero” William S. Hart. Crooked gambler Elliott reforms and agrees to raise money “by the rules” to build a church for a preacher who lost his life protecting Elliott in a barroom flare-up. In time Elliott comes across outlaw Marie Windsor who has a price on her head, enough to build the church, but Bill’s dedication calls for persuasion rather than capture and violence. Pursuing Windsor is Elliott’s old friend Marshal Forrest Tucker as well as three outlaw brothers. Trying to convince Windsor to give herself up, Elliott learns Marie is searching for her long lost sister—a sister she doesn’t realize is now married to Tucker who wants to keep his wife innocent of the fact her sister is an outlaw. In a final showdown, Tucker is badly wounded by Windsor who then learns her sister is Tucker’s wife. As Windsor finally sees the error of her ways and is repenting, the outlaw brothers arrive. About to gun Windsor down, she is saved at the last minute by a fast-shooting Elliott. 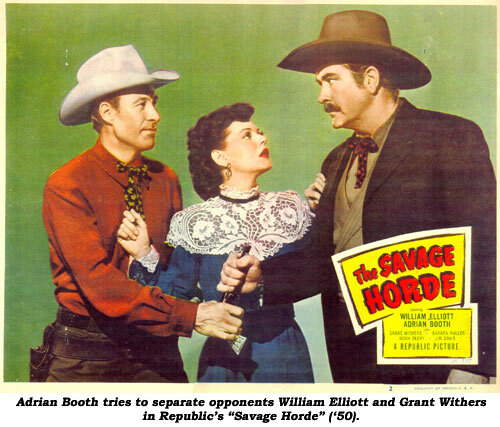 THE SAVAGE HORDE (‘50 Republic) Another of those good-badman Williams S. Hart-ish roles Bill so loved. After accidentally wounding his brother, Cavalry officer Jim Davis, gunhawk Elliott hangs up his guns, changes his name and moves to another territory. Even so, he quickly becomes embroiled in a range war, siding with small rancher Noah Beery Jr. against bigtime operator Grant Withers who wants to eliminate the small operators. Stuart Hamblen sings “Ridin’ Old Paint” and two others. 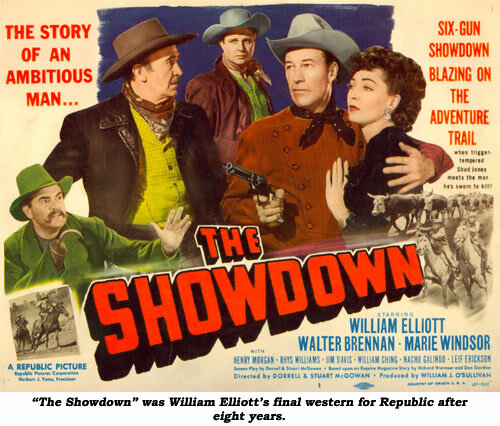 SHOWDOWN (‘50 Republic) Elliott’s last for Republic is an excellent example of western film noir, wonderfully scripted and directed by Dorrell and Stuart McGowan with cinematography from Reggie Lanning, a longtime staple at Republic. A distinctive western about vengeance, retribution and redemption with Elliott stern and driven in his ruthless determination to find and kill the man who shot his kid brother in the back and stole the money with which the pair were to buy a ranch. The bitter Elliott, convinced one of Walter Brennan’s trail drovers is the killer, accepts Brennan’s offer of driving his herd to Montana, hoping to identify the killer. Before they leave, saloon owner Marie Windsor, also a suspect, buys out Brennan’s herd and also joins the drive. Along the way, Brennan preaches to Elliott to forget revenge and let God’s law of retribution take care of the man. Not dissuaded, Elliott’s relentless suspicion of the drovers in his hunt for the killer makes him bitterly hated. However, once he eventually does find his brother’s murderer, the higher law of retribution and redemption takes over. An overlooked minor classic, far superior to some of Elliott’s better known B-plus westerns.